I have three charm bracelets that I have gotten at different points in my life. Charm bracelets can tell so much about your life so I am using my bracelets to tell my story. 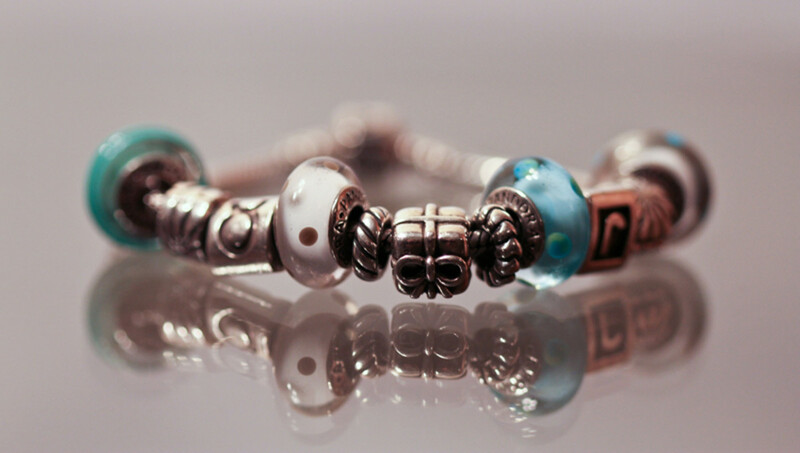 This lens will introduce you to Mary Beth aka mbgphoto by looking at the charms on my bracelet. I hope you enjoy hearing about my bracelets. Just for fun, I've added a quiz module at the end to test what you've learned. Be sure to stop by a leave me a note. I always love to hear from my readers. Charm Bracelets make great gifts!! Do you have someone special to give a charm or bracelet for the holidays! 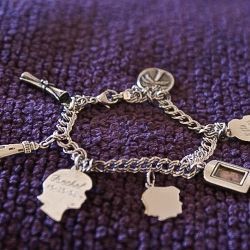 Have you been wanting to start a charm bracelet for yourself or someone else? This beautiful sterling silver bracelet would make a wonderful charm bracelet. This charm bracelet was started when I was about 15 year old. The charms were added through my high school days and into the time when I was a young mother in my twenties. Here are the charms listed in the order they are on the bracelet and a few notes on what they represent. Do you know someone who would love a charm bracelet? Below I am recommending a charm bracelet and a few starter charms. Of course you will want to make sure you tailor the charms to fit the personality of the person receiving the gift. If you are giving a charm bracelet for Christmas this tree would make a great first charm. Here is a great charm for the graduate. This charm is perfect for anyone who love music. 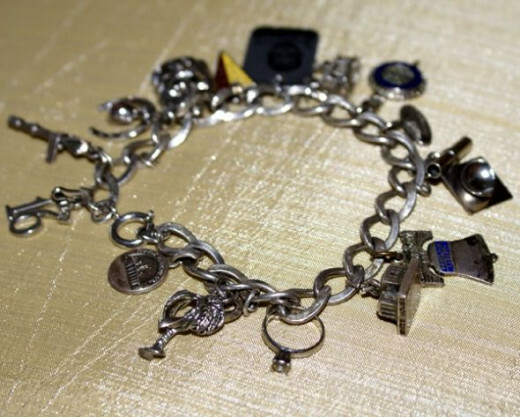 This charm bracelet was given to me on my 21st birthday along with the 21 charm. It has a charm for our 5th anniversary given to me by my husband and engraved with our names on the back. There is one charm bought on a vacation to New York City and the rest of the charms are from the years when our two children were small. There is a charm with each child's birthdate and several photo charms of the children, Linda born in 1971 and John born in 1974. This charm bracelet is gold colored and during those years I wore mostly gold jewelry. 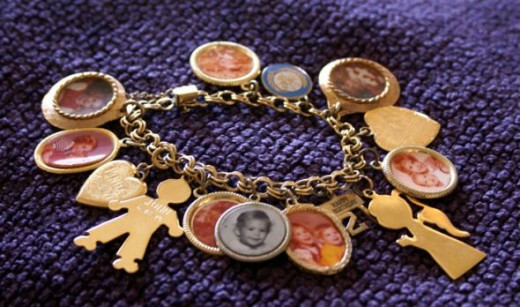 This charm bracelet was started for me by my daughter soon after her first child was born. The charms on this bracelet represent my life from age 54 till the present. The first charm is a silhouette of a little girl for my 1st granddaughter, Rachel. The next charm that was added was a photo frame charm that I use to put in a photo of my youngest grandchild. The third charm added was my 2nd granddaughter, Ella. The fourth charm added was a diploma to celebrate my graduating from college at age 57. The fifth charm was added just sixth months later and it is a palm tree to celebrate my retirement. The sixth charm added is a lighthouse. One of my favorite retirement hobbies is photographing lighthouses. The most recent charm added is for my 3rd granddaughter Kate. Since this writing I have added another charm for my newest granddaughter, Emily. Charms are a great way to remember travels. This charm would be a great reminder of Paris. I volunteer at the Butterfly House so this charm would make a great addition to my current bracelet. Charms can tell about things that you like to do or places you work. No, I do not have a charm bracelet, but I have always wanted one. Charm bracelets can outlast photos. And the jingling on the wrist is a constant reminder of those wonderful memories. My mom had a gorgeous charm bracelet she treasured. Once on a trip north to NY from Florida they stopped at a picnic area for lunch. Afterwards they continued driving north when mom realized she was missing her charm bracelet. She was heartsick, realizing she'd left it on the picnic table and it would most likely be gone. They retraced the miles and returned to find that it was STILL there. She was so grateful as the bracelet had such memories for her. 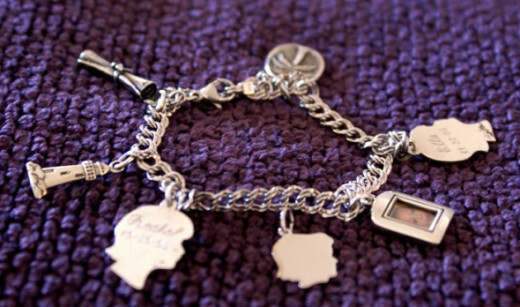 Charm bracelets can become the 'memories' of a lifetime! I just love charm bracelets. It's like wearing memories -- keeping them with you all the time. Thanks for sharing this wonderful gift idea! 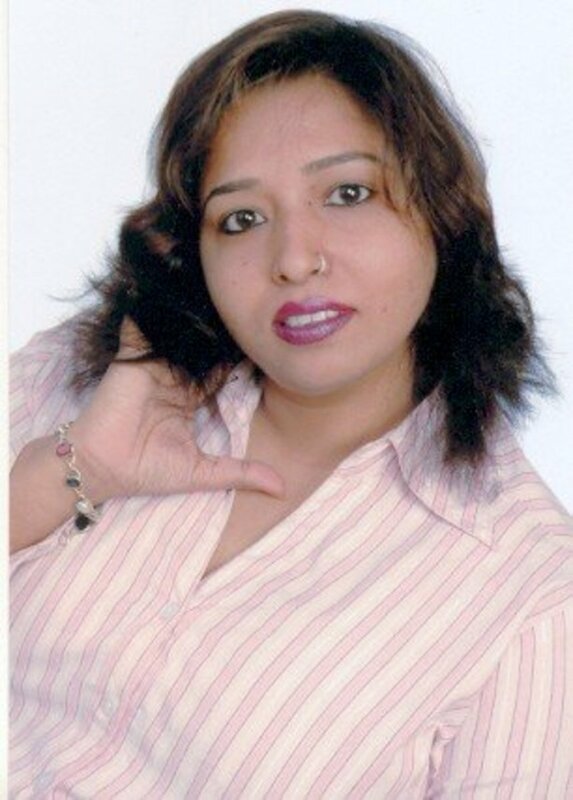 My charm bracelets also carry charms with great sentimental value to them. Although I now have a few new ones to add. You know I love charm bracelets and I love the idea of adding a Christmas tree to a charm bracelet! My charm bracelet is much like yours. We would buy the charms at the department store. I think they were Monet. I do not have a charm bracelet, but I would love to have one. Great lens. Yes and no. I have one but not with personal charms. I got 90% and learned a lot about you. Nice going on getting that college degree. Very nice lens about you. Well, I have a more recent charm bracelet -- however, the charm bracelet I had in my youth was lost -- mom asked a coworker to add a charm to it and she never got it back. Please follow the Purple Star Directory to find where your purple starred lenses have been featured. I love this lens!! I had a charm bracelet as a teenager but it's been lost to the ages. I love charm bracelets. My daughter bought me one last year. Blessing this lens! My sister and I both have a bracelet that has been building since childhood. We've begun the tradition with her daughter as well. 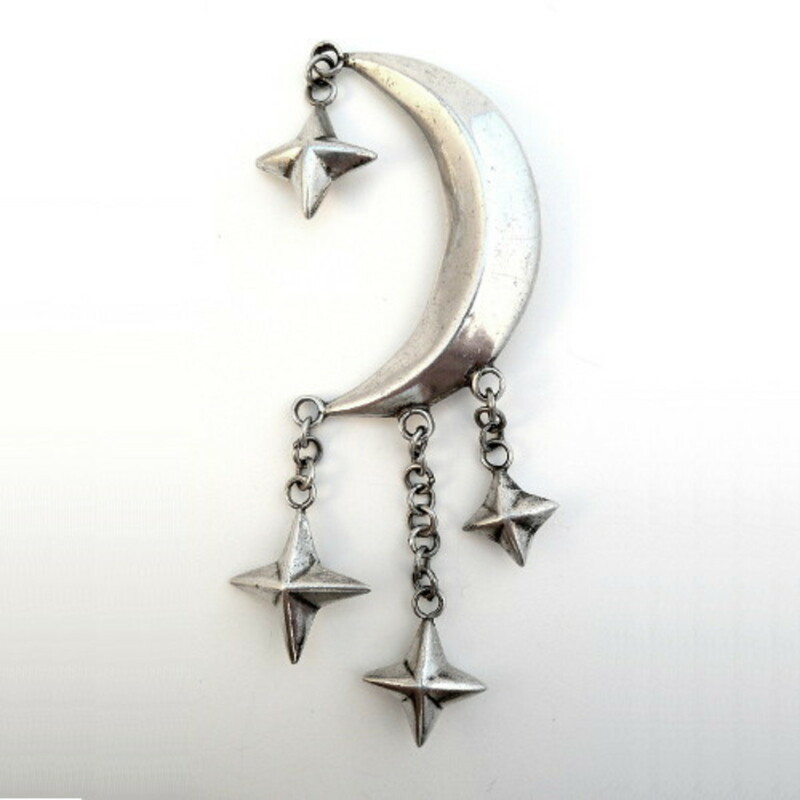 Ebay is amazing for finding just the right charm to mark an occasion. 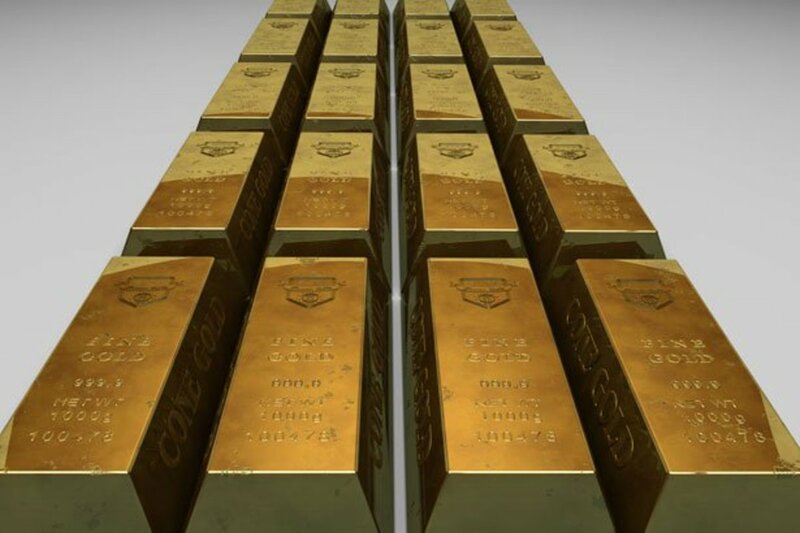 What wonderful treasures! I really love this idea. It has been years since I have seen or thought about charm bracelets. I had one in high school, but not since. Totally awesome that you have several to mark those wonderful memories and milestones. Angel Blessed and added to Squid Angel Mouse Tracks. What a beautiful idea. Keeping charms to remember or celebrate important occassions in your life. IGreat lens idea too. After reading your stories, I now definitely want a charm bracelet. I've always admired them but never really considered how they are a way to highlight our "years". What a very neat and original lens and idea. congrats on your purple star! I never had one, but enjoyed hearing about yours. What a unique lens! I do have a charm bracelet from my teen years...in fact I have a Sweet 16 charm that looks just like yours. This brings back memories. I'd forgotten all about my charm bracelet. Congratulations on your purple star! I had some charm bracelets when I was younger. The one here for mother is interesting. I have a charm bracelet that was my grandmother's. 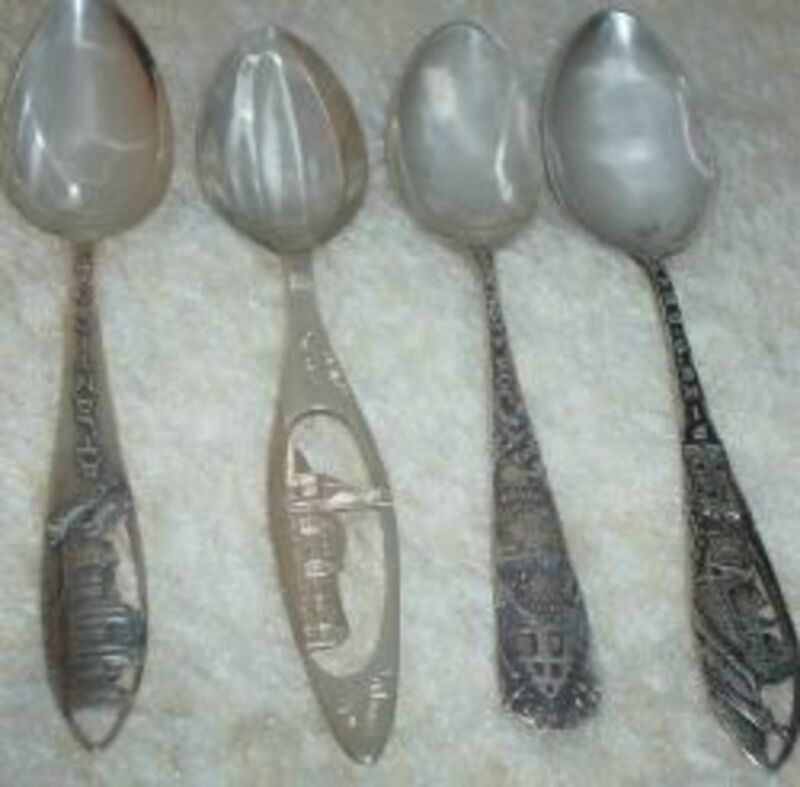 It has many charms like yours, telling of special events (like her grandchildren's births, hobbies, and anniversaries). I love the story-rich charms. Your charm bracelets are wonderful and highlight so many special events, achievements, and memories. Congrats on the Purple Star - well deserved! Me again. Congratulations on your purple star! Great life story told through charm bracelets. I love it. Blessed! I love this lens! May be your best yet!! This is so cool! Love the way you used your charm bracelets to tell us the story of your life, with different bracelets for different phases. Great job! Using a charm bracelet to describe yourself and your life is very unique! Great job! I don't have a charm bracelet but I have in my possession both my grandmothers and mothers bracelets. They also tell a story. I love the Sterling Silver Butterfly Charm. It makes me think I need a charm bracelet. What a great lens. how wonderful to have bracelets that depict your life! wow! Oh me. I missed one and it was because I misread the question. Shoot and I knew the right answer. Great quiz and it made it fun to learn about you through your Charm Bracelet. Very clever. I really enjoyed!